Due to its lean structure and easy integration with multiple development environments, Advantage Database Server (ADS) by Sybase, an SAP company, is very popular amongst SMB (Small and Medium Business) companies. The flexibility to switch from free local data access to a full blown client/server database management system without the need of any source code modifications, makes ADS the ideal solution for applications that have to serve different markets. The Advantage Pocket Guide series will, divided into more or less independent parts, provide knowledge around Advantage Database Server. The characteristics of this series are designed to be brief and concise, without too much embroidery. It will not be able to replace a programming manual, but instead provide you with a paperback, compact in content and format, which is intended to be a quick reference guide for every day use. This first volume deals with installation, configuration and administration of Advantage Database Server on Microsoft Windows. 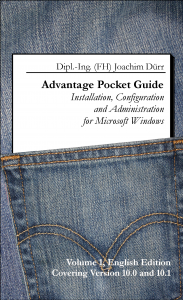 The knowledge contained in this booklet is mainly covering versions 10.0 and 10.1 but might, with some minor restrictions, also be used for older versions. This second volume concentrates on developing Advantage based applications with Embarcadero‘s Delphi. The knowledge contained in this booklet is mainly covering ADS version 11 and Delphi XE2 but might, with some minor restrictions, also be used for older versions.